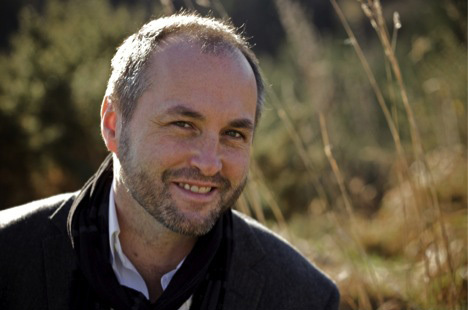 Colum McCann was born in Dublin, Ireland in 1965 and now lives in New York, where he is a Distinguished Professor of Creative Writing at Hunter College. His work has been published in 35 languages and has appeared in the New Yorker, Esquire, Paris Review, Granta, The Atlantic Monthly, GQ, Tin House, Bomb as well as in international publications such as New York Times, The Times, The Irish Times, la Repubblica, Die Zeit, Paris Match, The Guardian, and The Independent. He studied journalism at the Dublin Institute of Technology and became a reporter for The Irish Press Group, where he had his own column and byline in the Evening Press by the age of twenty-one. 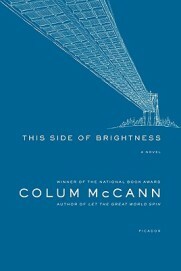 McCann’s novels include Songdogs, This Side of Brightness, Dancer, Zoli, Let the Great World Spin, and TransAtlantic. His short story collections include Fishing the Sloe-Black River and Everything in This Country Must. His literary awards include the 2009 National Book Award, the 2010 International IMPAC Dublin Literary Award, and several other major honors. He is a founding member of Narrative 4, a global organization headed up by some of the world’s most renowned and influential authors, artists, and community leaders that promotes empathy through the exchange of stories. In early April of this year, McCann and I sat down and talked late one morning at Western Carolina University, where he was one of the featured speakers for the college’s annual LitFest. 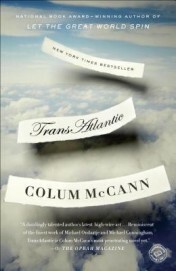 Late last fall I had bought a copy of his novel TransAtlantic (Random House, $16) for my wife, because she had recently returned from a trip to Newfoundland, where portions of the book are set. I ended up reading the book before she did. Thomas Rain Crowe: Maybe the best place to start is at the beginning. 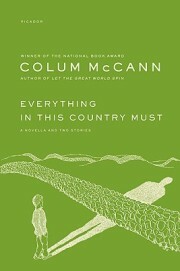 Talk a little about Ireland and even your early years there before you came to live in the U.S.
Colum McCann: I always felt that I belonged up in Northern Ireland in a certain way. I liked going up there. My mom was born on a small farm in Derry. It always amazed me that you’d go past the border and suddenly everything changed. The roads were different, the postboxes were red. Why would the postboxes be a different color? Why? And then a young soldier would get on the bus . . . it was like stepping into a new and rather frightening world. In those days growing up in Dublin no one in my group of friends really cared much about what was going on up north, as if it were a completely foreign and different country. But for some reason it was in my blood. As a teenager I could ride on my bicycle and get up there. Belfast was only a hundred miles from Dublin and only seventy miles to the border. I used to do it in a day and come back the next night. But it was always the same place to me—all of Ireland. Thankfully, now, all those borders are gradually dissolving since the peace accords. Also, I loved the West of Ireland. I worked for a newspaper in County Mayo when I was seventeen. That was a great experience. There are some beautiful places there along the coast—I loved walking the strand in Louisburgh. It was called a “famine beach” by the locals. Sometimes the waves would unearth bones. That eerie poetry of place. TRC: Have you ever been to the pub The George there along the coast in County Mayo? I was there on my first trip to Ireland and had a great night of drinking Guinness and singing and reciting Robert Service poems. CM: Oh God, yes, there are some great pubs out there. I lost my head in a few of those places! But, you know, the Irish pubs are dying now. First of all, the Irish economy has collapsed. Then, the huge taxes on the beverages. A pint sometimes costs $8 (five pounds) now over the counter at the pubs. So the whole tradition is changing and the nature of conversation is shrinking and people are not going out like they used to and are staying at home and drawing the curtains. And when people draw the curtains, they are drawing the curtains on the imagination, too. Maybe something new will take its place, but that’s all happened in the last five years. TRC: That’s very sad. The pubs, the socializing and the music are what attracted me to Ireland in the first place and then brought me back again. CM: When were you last there? TRC: In the late 1990s—for the launch in Dublin for the contemporary Celtic language anthology that I edited and published with the press I run, New Native Press. CM: A few years later, in the early 2000s—2003, 2004—Ireland became kind of decadent. Everyone was talking about their upscale apartments and their new BMWs. It seemed kind of vulgar to me. I would go home and a lot of people I knew were getting caught up in all of that. Quite frankly, Ireland was not the nicest place to be. And there was an arrogance about it, too. It seemed very adolescent—as if you were young again, and the parents were gone for the weekend, and you were having a big party. People are jumping from the stairways onto the chandeliers and all that carrying on. And then, about five o’clock in the morning, someone shouts, “the parents are coming!” And the parents happened to be German bankers. And the party was over, which is what happened to Ireland. The German and the Swiss bankers—they owned us. We had mortgaged ourselves and mortgaged our future. And our government had sold us out. It was really, really bad. The people got sold down the river. TRC: Sounds a lot like what happened here in the U.S.
CM: It was ten times worse in Ireland. And nobody got busted. They had enough money to get away with it. I tried to write a little bit about that in TransAtlantic—when Hannah loses her house. I think that the two big Irish stories for the last twenty-five years have been the collapse of the economy and then the peace process. One good, one bad. TRC: Maybe the English will finally give up their hold on Northern Ireland. I thought that maybe Blair would come to that conclusion and do something about it. But he didn’t. CM: Well, you know, the Queen, she came and bowed her head in the Garden of Remembrance. And for Irish people that was a big deal. But . . . there is still a lot of work to do in Ireland. There is still a sectarianism in Nothern Ireland—still a lot of kids going to separate Catholic and Protestant schools. The peace accords are now sixteen years old. George Mitchell can look at his son, now, and know the length of the peace process by knowing the age of his boy. I think that the peace process is one of our greatest accomplishments. TRC: I was reading somewhere recently where someone who was interviewing you asked you why you didn’t write more about Ireland. I was puzzled by that, as I had just read all of your novels and short stories and found that a lot of what you have written is about Ireland. CM: Yes, this all depends . . . If they read Zoli or Dancer, there is no mention of Ireland in those two books. But in the other ones there’s always something. My take on this is that even when you’re writing a book that has no particular physical Ireland in it, it’s still there. Which is part of the process of expanding one’s own consciousness and maybe even the national consciousness in a certain way. We’re saying that every story belongs to us. And if we’re really going to be healthy, proper, empathetic people, we need to understand the stories of others. Yes, we need to understand ourselves, but first we need to understand the stories of others. So, you see, in books like Zoli and Dancer it’s still an Irish story even though none of it takes place in Ireland. 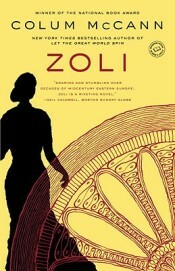 TRC: After reading Zoli I was wondering who that character may have been based on, as you had brought her to life for me. So much so that I was sure that you had modeled her after some specific literary character in history. Your portrayal of the diversity of cultures and the strata of lifestyles in your characters and what someone called “your attraction to ‘small people’” has fascinated me. I’m wondering what your attraction is to these so-called ‘small people’ and why you like to write about them. CM: Yes, but there are a few characters such as Frederick Douglass and Senator Mitchell in TransAtlantic who aren’t your everyday people. But I do tend to write about characters who are more anonymous. Anonymous is a good word for these characters. I think it is our job, as writers, to be epic. Epic and tiny at the same time. If you’re going to be a fiction writer, why not take on something that means something. In doing this, you must understand that within that epic structure it is the tiny story that is possibly more important. I’ll tell you where it actually all came from for me. After I finished my collection of stories about Northern Ireland, Everything in This Country Must, I was casting around for a novel that would be truly an international novel. I started with this singular idea that I was going to write a novel that would have in it every country in the world, somehow. Naïve, right? But, I’m sitting one night in a pub in New York and talking with an Irish guy named Jimmy who was the same age as me, but who had grown up completely different from me. I grew up middle class, suburban. He, by contrast, had grown up totally working class—in a small flat in Dublin. And he was telling me how his dad would come home at night and beat the living daylights out of him, almost every single day. So, he tells me this story, that one night in 1974 his dad came home carrying a large television set. So, long story short, his dad sets up the TV in the house and the first image that comes on and that this fellow Jimmy sees—is the image of Rudolf Nureyev dancing. What an amazing thing! 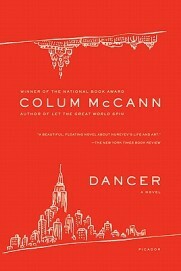 I was fascinated by this story and the origin of my novel Dancer stems from that. I remember giving an interview about six months before that incident in the pub to Atlantic Monthly magazine, where I said that writing about real people showed a failure of the writer’s imagination. Talk about eating your own words—six months later I started writing a fictional account of the life of Rudolf Nureyev. Now that story that Jimmy told me about himself in the pub in New York would never make it into any official biography of Rudolf Nureyev. But it’s such a beautiful story—a nine-year-old working-class Dublin boy carrying the world’s greatest dancer in his arms and sort of falls in love with him. This supposedly anonymous story coupled with all the other possible anonymous stories that are similar might make up an alternative official biography. Rather than telling the biography of Rudolf Nureyev through the viewpoint of the official legislators, the official historians, the “big people” who are in charge of the Paris Ballet or the Royal Ballet, telling the story on the ground, close to the ground. That’s where the real action is. It’s a kind of poetic notion in a way. God, I often wished I could be a poet. TRC: Be careful what you ask for! It’s not all that romantic “on the ground,” as you say. But, you know, your fiction writing is poetic in many ways. Which reminds me of another question I wanted to ask you—about a comment you made in a conversation with Michael Ondaatje some time ago where you said that you almost always start writing a story with an image, and then move toward sound and rhythm. This is a very poetic idea in terms of process. Can you expound on what you mean by this statement and this process as it applies to writing prose? CM: Well, like any poet, I love the sound and the rhythm and the music. Gerard Manley Hopkins and Dylan Thomas were two of my early heroes. The whole notion of the sound of the landscape and the rhythm in the poem captivated me. I certainly liked listening to the recordings of Dylan Thomas that my dad would play on the stereo. Especially at Christmas time when we’d listen to A Child’s Christmas in Wales and his poetry. And also in school we were very much taught by learning songs and poems. This was very important to me. To find the inherent music. But you must have an image first. Something in which to plant the language. Something from which the language will sprout. To develop the branches and split the sky. I think so much of the original growth comes from music, the way the words touch each other on the page, that orchestra of language. And this is why I say that I love poetry so much. It means a lot to me. I feel like I’m down in the well of the orchestra. And all that original poetry returns to me. In fact, I have three kids now, and the only thing that I ask for for Christmas and for my birthday is that each one of them memorize and recite a poem. Which they do and seem to enjoy. By the age of fourteen, my oldest boy had memorized all of “The Love Song of J. Alfred Prufrock”—the whole thing. Pretty amazing, huh? Of course the importance of poetry and the importance of someone like Seamus Heaney looms large in the Irish culture. TRC: I remember on my first visit to Ireland, the Irish friends we were staying with in Dublin drove us by Seamus Heaney’s home and we could see the light on in the second floor window and you could see the book cases and I imagined him up there writing his poems. A very vivid memory for me. CM: That’s a very interesting story, as a friend of mine described him as being our national lighthouse. So, I love that you had the experience of seeing that image for yourself. Seamus was quite a character and so generous. And his generosity tortured him, too, in a way. Now, perhaps, it doesn’t seem like he may have given too much of himself away. But there were times when all he wanted was a little silence, a little solitude. All he wanted to do was to pull away from the world and to get back into the poem. By the time that he was in his forties he was already established and part of the literary establishment, as it were, and with all the awards and the accolades his time wasn’t really his own, and I think all that wore on him a bit and all that he wanted to do was to hide away. TRC: I think the same fate was visited upon Dylan Thomas. All the attention drove him to drink when he was out in public. At home, he would saunter up to the Brown’s Hotel in Laugharne after an afternoon of writing in his shed and sip on a single pint of ale for a couple of hours while he talked to the locals and wrote down notes. I think, he, too, kind of craved the simple quiet life, but was driven to success by his need to make money to support his family. And so he would go to London or the U.S. and give readings or do reading tours and would be wined and dined, which led to his ultimate demise. CM: Yeah, seventeen whiskeys at the White Horse Tavern is not a good idea for a diabetic! TRC: I think that of all your books, my favorite characters are in This Side of Brightness. I was fascinated by Treefrog and Nathan. And by the setting—of the underground “tunnel culture” in the subways and river tunnels under New York City. How did you come by this subject? Do you enjoy creating these real/imaginary worlds using the building blocks of factual research? CM: Yes, Treefrog and Clarence Nathan Walker. I have a fondness for that story, too. I don’t know why, perhaps because I wrote it so long ago and can no longer recognize its flaws. On a purely logistical level, I’d been living in Japan and then back in Ireland and I’d just moved to New York and got a contract to write something for the magazine Grant Street. And I was talking to this sociologist there named Terry Williams, and he was telling me about the homeless people who were living in the subway tunnels. “A couple thousand people are living down there,” he said. I’d been in New York about four or five months at that time and hadn’t even heard of this. As it turned out hardly anyone knew about this at all. It was kind of a myth that was floating around the city, but no one knew about any of the reality of it. So, I went down to the tunnels the very next day and started hanging out. Standing outside the tunnels. Having a cigarette. I’d stand there and have a smoke and after a while people would ask me for a cigarette. When you light a person’s cigarette, you look them right in their eyes and cup their hands, and touch them, and then give them fire. There’s something Promethean, something primal about this. You make up your mind about someone in this situation very quickly. And, so, I was invited to go inside the tunnel by these people and they would show me where they lived. For the next year and a half I got to know them. And then I wrote the book and it was one of those books that sort of came out of nowhere, or at least out of a small coincidence. TRC: I’ve noticed in this book, as well as in Songdogs, Let the Great World Spin, and TransAtlantic, you’ll dovetail multiple story lines, multiple characters, and even play with time. This would seem to be something of a stylistic pattern of yours. CM: Yes, there are two different stories in This Side of Brightness—one taking place at the beginning of the 20th century and one taking place at the end of the 20th century. But they’re like train tracks and they eventually meet. TRC: All your stories, long and short, visit other cultures, interesting characters and other centuries, but that one was almost like visiting another planet. CM: Well, it was crazy down there. It was really, really crazy there. When you see people living in those situations it is like a brother from another planet. But I learned so much—just in learning how to talk to and get along with them. And the fact that I was Irish, that really helped. These guys were mostly African Americans and being Irish they identified me, rightly or wrongly, as not being part of the oppressive regime that had forced them to live underground. And so there was an ease when they would talk to me. They were very interesting people. There was a woman down there whose name was Denise. One time I went down there and I had with me one of those airplane sachets—you know, the moist towels that you clean your hands with that they give you on the planes. Turns out she loved these things. And so every time I’d go into the tunnels I’d bring her a couple of these sachet towels. These little towels made her so happy. And she’d carry these around in her pocketbook and she’d clean her hands. So, one day I decided I was going to be really nice to her and so I bought a big box of these towels. Not in sachets, but just a big box. And her immediate reaction was to cry. I was surprised and saddened by this. And what it was was that she loved the dignity of carrying around these little sachets and using them in a dignified way. And for me to bring her down a big box of towels somehow was insulting or too pointed, if you see what I mean. And it’s little interactions like that that help you to see and understand the world and how it works. The bottom line is: we have to listen to other people’s stories. That’s the thing. And that’s the only way that we eventually get to know ourselves. So, it’s a bit ironic for me to be here in this situation today, at this moment, as I like to listen and here I am blabbing away. (Laughs). TRC: In terms of stories and listening, you’re in the right place here in the Southern Appalachian mountains, as this region is rich with its history of storytelling and the oral tradition. The Scots and the Irish who migrated and settled here generations ago have left their legacy in these hills. My mother, who is of Scottish descent, used to read, recite and sing to me at night when I was young. Mostly Scottish fiction, Robert Louis Stevenson and Bobby Burns’s poems and nursery songs. So, like you, I grew up listening to stories and songs. Now, I still listen, but also love to read. There’s nothing better than a good story. CM: How do you feel about the “Southern writer” tag? TRC: Generally, I don’t like labels. The South and Southern writing, and particularly Southern fiction, have changed over the years. Previously you’d hear about writers like Faulkner and Eudora Welty and Tennessee Williams, but now there’s a “Southern Appalachian” renaissance going on with Charles Frazier, Ron Rash, Pam Duncan, Wayne Caldwell, and others, most of them coming out of the Blue Ridge Mountains—from right here—which was not the case fifty years ago. Getting back to your writing and the development of characters, I was reading somewhere that the character of Corrigan in Let the Great World Spin comes from the real life person of Daniel Berrigan, the legendary social-activist priest in New York City. CM: Yes, that’s true. He is still alive and lives down in the Village now and is not well, I hear. I must get down to see him when I get back. I will do this, as I think he is one of the most extraordinary human beings I’ve ever come across. He inspired the character of Corrigan. And in fact, when I first started writing the character of Corrigan, I called him “Berrigan.” I really wanted to get the texture of the real man to penetrate the character on the page. And then I changed the name from Berrigan to Corrigan later. In truth, the character of Corrigan is an amalgam of an Italian man that I knew—my wife’s cousin, in fact, and was a monk in one of the Catholic orders—and Daniel Berrigan. TRC: I have to tell you that I was heartbroken when he was killed off early on in Let the Great World Spin. CM: Well, you know, that’s exactly how I felt, as well. I was writing away with this Corrigan character, and I was enjoying it and all of a sudden this strange thing happened. And it was almost like this car crash happened to me. And I’m saying to myself “you can’t do this, you can’t do this. You can’t kill off your main character in the first third of the book.” But . . . I believe that the characters in one’s writing should have a life of their own. I could have put Corrigan on a life-support system in the local hospital and had him end up okay. But in this particular case it was as if the character of Corrigan insisted that he must die. And I couldn’t understand this. Really couldn’t understand this for a long time, because this was not the way that I wanted it to happen. But the only way that really felt true and authentic and proper and right was that he would die. But it took me a long time to come to terms with this. Not like Nabakov who felt that his characters were his galley slaves. TRC: And then there’s the “common thread,” if you will, in Let the Great World Spin—of the side story of the Frenchman who walked a tightrope wire between the World Trade Center buildings, which was an international news story when it happened. 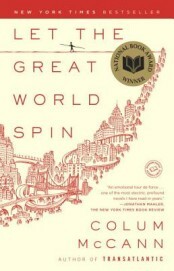 CM: Yes, when I found the picture—that I’ve put in the book—of Philippe Petit crossing the wire between the World Trade towers and with the plane in the background, I said to myself “that’s it!” which is what inspired the writing of Let the Great World Spin. And you’re right, that event, that character is what all the characters in the book have in common—a touchstone, a common thread. TRC: Given everything we’ve been talking about here, I’m wondering what you think about the way that publishing and all the current technology is going. Has that affected how you write and how you see the future of literature and books? CM: Would you believe fifty years ago we’d even have thought that we’d all be walking around with our lives all in one little machine? I’m not overly concerned with all the technology that we’re having to deal with now. I think people will be looking back nostalgically on the way things are today saying, “Ah, back in my grandfather’s day in 2014 they didn’t have any chips inside their brains.” So, we’ll be nostalgic and romantic for these days, just as we now are beginning to be nostalgic and romantic for paper books, telephones and television. While it’s true that we are experiencing a kind of technological revolution at the present moment, I think that one of the great revolutions of the future will be how we perceive the imagination. Right now we tend to perceive our imagination as being not a physical thing. We think of the imagination as being kind of airy, that kind of floats and is non-corporeal. But I think that as time goes on and as technology keeps progressing that we’ll eventually come to see our imagination as a physical thing. And in keeping with how things usually go, the powers that be will eventually try to monetize our imagination. To put a monetary value on it. By then our imaginations will be as important to us as are our hands and our fingers. TRC: Your ideas, here, about the imagination remind me of what the great ecologian Thomas Berry said back when there was a lot of talk during the W. Bush administration of people going and living on the moon after we’d depleted the resources on planet Earth. Berry’s response was that living in such a desolate and barren place as the moon, which is devoid of diversity of atmosphere, plant and animal life, etc., would compromise our imagination, which is dependent upon a universe of diversity. He was very confident that in such an environment the imagination would dry up and wither away, which would precede the demise of the rest of the human body, which would eventually dry up and wither away, as well. His premise was that we need our imaginations in order to exist and function fully as human beings. CM: Absolutely. And speaking of Berrys, do you know Wendell Berry? I think he, too, is one of the great souls in our midst these days. A great writer and someone who reminds us of how we should be walking on the earth, consciously, and with reverence and respect. TRC: Good words to end on. And may our great world continue to spin and your great writing, as well. CM: Thank you. That’s very kind. This entry was posted in Uncategorized and tagged Summer 2014 on July 16, 2014 by Kelly.